Limited quantities on all pass types available. Pass prices will increase as ticket levels sell out as noted below. Stay tuned for travel packages including lodging and shuttle options! 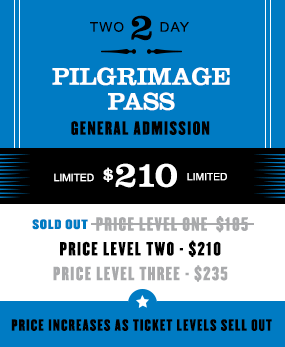 PILGRIMAGE PASS: WHAT YOU GET! 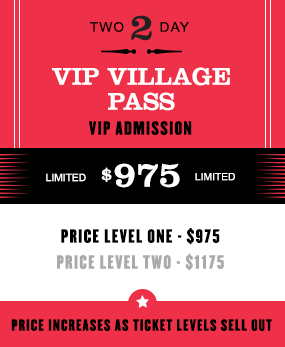 FRANKLIN SYNERGY BANK VIP VILLAGE PASS: WHAT YOU GET! 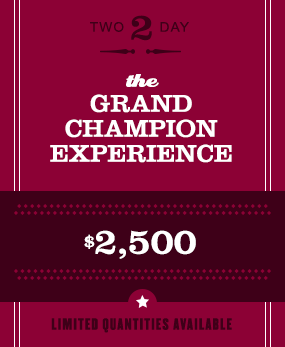 GRAND CHAMPION EXPERIENCE: WHAT YOU GET! 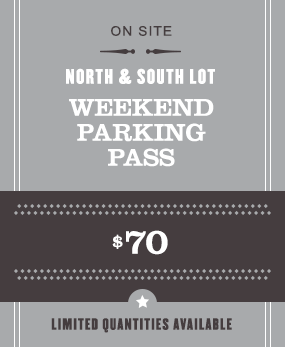 WEEKEND PARKING PASS: WHAT YOU GET! In order to expedite both entering and exiting the festival, we are offering you the opportunity to pre-select your parking lot (North or South lot) as each one has a different exiting route which has been developed to make your trip home as seamless as possible. Parking passes will be designated for either the North or South lots (not both) off Franklin Road. WHAT LOT SHOULD I CHOOSE? When entering the festival, access to both lots will be from Franklin Road southbound via Mack Hatcher ONLY. When choosing your preference in parking lot, determine where you will be heading AFTER the event. Southbound access from the North Lot and northbound access from the South Lot will NOT be permitted when exiting the event. A reminder that all VIP and GCE orders include parking (1 pass for orders of up to 4 tickets, 2 for orders of 5 or more). All VIP and GCE parking will be in the South Lot for proximity to amenities. Off-Site/Nearby Parking will be available on show days on a first come, first serve basis for $20/day cash only, free for carpools of 3 or more. Walking, riding and canoeing to the festival is highly encouraged. We offer complimentary on-site bicycle and canoe parking. Visit our Getting Here page for additional info. Layaway plans available at check-out. Shipping, taxes and fees are not included in listed prices. Fees include a tax-deductible donation to the Pilgrimage Foundation. Exact breakdown of additional costs to be provided during the purchase process. Pricing subject to change without notice. Tickets are non-transferrable and all bands must remain on patron's wrist once applied. For more ticketing information or help please contact Frontgate Tickets at info@frontgatetickets.com or 1-888-512-7469. Talent and Schedule subject to change. Rain or shine except in the case of inclement weather that poses a threat to patron safety. Foundation/Parks fee benefits Friends of Franklin Parks, MusiCares and The Park at Harlinsdale Farm. Several nearby overflow lots will be available if venue parking is full. More Information will be available on the Pilgrimage App and highway signage. Walking, riding and canoeing to the festival is highly encouraged. Single day car parking can be purchased with cash at our off-site lots. Complimentary on-site bicycle parking and canoe parking at Harlinsdale Landing. Visit our Getting Here page for additional info.